Gas bills can be confusing. So we’re going to break it down. Let’s get to it. Please note that the numbers and charges used are for illustrative purposes only and may not match the numbers on your actual bill. All charges described in this section are subject to change upon 30 days' notice as provided in our Terms of Service. + How will I be billed? Variable Price Plans - Your gas service will be billed at a price per therm that may change or remain the same based on market conditions change based on market conditions. 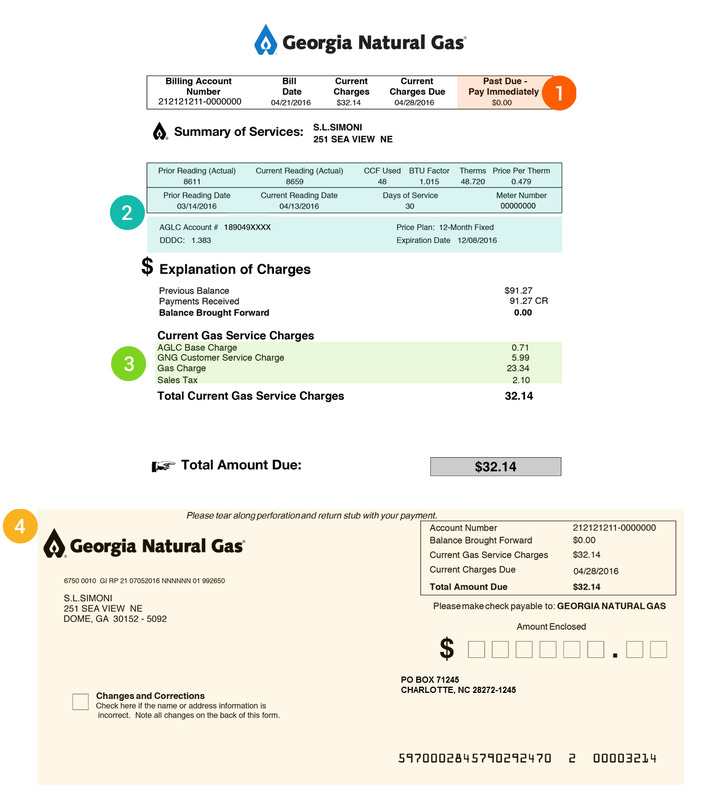 The price per therm used to calculate your gas charge is the Georgia Natural Gas® price in effect on the first day of your meter reading cycle. Your gas service will be billed under a variable plan on a month-to-month basis. You may switch to another price plan for which you qualify at no additional charge. Guaranteed Bill - You will be protected from fluctuations in both weather and market prices for a year. Rather than paying a “rate” or “price per therm,” you will be billed a flat amount for each standard service period that begins during the term of your one-year agreement, and GNG will prorate the amount for periods shorter or longer than a standard service period of 27-33 days. This amount, the Guaranteed Bill Charge, is based on historical gas usage at the premises and expected natural gas prices. Fixed Price Plan - Gas service is billed at a fixed price per therm. Although GNG's currently available fixed prices may change at any time, the price used to calculate your gas charge for the full length of the plan will be GNG's price in effect at the time you select the plan. Your fixed price will remain in effect for each service period that begins during the term of your agreement. Pre-pay Plan - Gas service is billed as estimated gas charges in advance of the actual gas usage. Estimated gas charges are calculated by multiplying the current variable Pre-Pay plan price per therm in effect at the time of the estimate by the expected usage. Once your actual charges and the variable price for the billing period are available, they are trued up with the previous estimate. For detailed information about GNG bills, see our Terms and Conditions of Service. AGLC Base Charge – The AGLC Base Charge is a regulated charge from the utility (AGLC) that is billed through each gas marketer. GNG bills a full base charge regardless of the number of days of service. GNG Customer Service Charge – A charge related to GNG’s cost of maintaining and servicing your account. This charge may vary based on a customer’s credit criteria, payment history and/or individual service requirements. GNG assesses a full customer service charge for each service period regardless of the number of days of service. Gas Charge – The charge for gas used during the service period. The gas charge can vary based on the quantity of gas used and the price per therm for the service period. Interstate Pipeline Capacity Charge (if applicable) – A transportation charge that is based on Dedicated Design Day Capacity (DDDC). GNG bills a full interstate pipeline capacity charge for each service period regardless of the number of days of service. Sales Tax – As required by state law, sales tax will be applied to all charges except Late Charges. Guaranteed Bill Charge – This charge includes your AGLC Base Charge, GNG Customer Service Charge, Gas Charge and Interstate Pipeline Capacity Charge (if applicable). Taxes: You are responsible for all applicable federal, state, and local taxes and charges. If you are a tax-exempt entity, it is your responsibility to provide GNG with the necessary exemption certificate. Returned Payment Charge: You will be assessed a nonrefundable charge for any payment to your account that is not accepted for its full amount, including returned payments associated with a bank draft payment. At our option, we will assess this charge the first time your check or payment is not accepted, even if it is honored upon resubmission. Late Charge: If your account becomes past due by $30 or more, you will be billed a Late Charge of 1.5% of the unpaid amount, with a minimum charge of $10, to offset GNG’s additional costs. Fixed Rate Early Termination Charge: Your account will be assessed an early termination charge if you breach a fixed price agreement with GNG. This charge is intended to compensate GNG for losses and expenses it estimates it will incur as the result of the early termination of a customer’s fixed price plan. Guaranteed Bill Early Termination Charge: Your account will be assessed an early termination charge if you breach a Guaranteed Bill plan agreement with GNG. This charge is intended to compensate GNG for losses and expenses it estimates it will incur as the result of the early termination of a customer’s Guaranteed Bill plan. Service Connection Charge: If you are establishing new service at a premises or reestablishing service that has been disconnected, you will be assessed a $60 Service Connection Charge, of which $25 is a pass-through charge from AGLC. This charge does not apply to customers who are switching to GNG at their current premise. Service Reconnection Charge: If you are reestablishing service at the same premises, you will be assessed a $60 Service Reconnection Charge, of which $25 is a pass-through from AGLC. Seasonal Service Reconnection Charge: If your service is voluntarily disconnected and reconnected at a single location within a 12-month period and you are a residential customer, you will be assessed a reconnection charge of $75, of which $50 is a pass-through charge from AGLC. If you are a commercial customer, the reconnection charge is $85, and the AGLC pass-through is $60. Meter Set Charge: If you are the first occupant of a premises after a meter is installed, you will be assessed a $60 Meter Set Charge, of which $50 is a pass-though charge from AGLC. GNG Signature Service Charge – A charge incurred if a customer enters into an agreement to receive special ancillary services not generally included as part of GNG’s price plan offerings. Depending upon the signature service selected, the charge may be one-time or recurring, and it may be either flat or volumetric. Because GNG may offer several signature services, the Signature Service Charge will be listed on the bill by its specific name. Past due charges are due immediately and subject to a Late Charge consistent with GNG’s Terms of Service. Readings from your gas meter. The prior reading is only an estimate, whereas the current reading is the actual gas your meter shows you used during the current billing period. The actual gas your meter shows you used during the current billing period, stated in hundreds of cubic feet. A measure of energy in British Thermal Units (BTUs) that is used as a conversion factor to calculate in Therms the amount of gas you consumed. The price you pay per therm of gas consumed. Dedicated Design Day Capacity is the amount of space reserved in the pipeline for gas needed to serve your premises on the coldest day of the year. Your DDDC is used to calculate your AGLC Base Charge. A regulated charge from the utility (AGLC) that’s billed through each gas marketer. GNG bills a full base charge regardless of the number of days of service. The charge for gas used during the service period. The gas charge can vary based on the quantity of gas used and the price per therm for the service period. As required by state law, sales tax will be applied to all charges except Late Charges. When paying by mail, the remittance coupon must be completed and mailed with your payment. Your first bill - The amount you were requested to pay upon enrolling on the Pre-Pay plan. Subsequent bills - The amount GNG asked you to pay on your prior month’s bill. 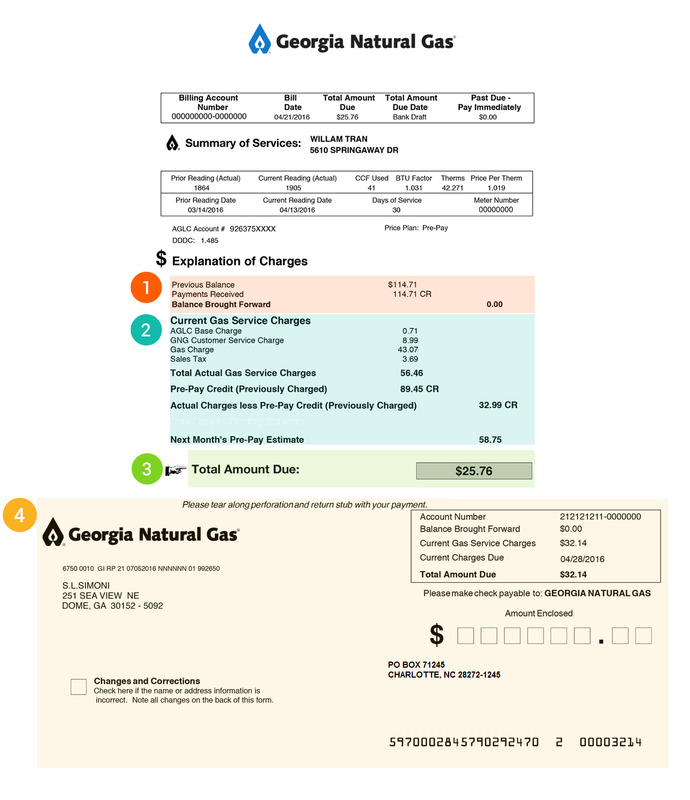 Your First bill - The amount you paid to get your gas service turned on with or switched to GNG. Subsequent bills - The amount you paid. Your first bill - If you paid the initially requested pre-payment within the requested time frame, this line will likely be $0.00. Subsequent bills - This is any unpaid balance that remains from your last GNG bill. If you paid GNG exactly what you were asked to pay on your last bill, this amount will be $0. On Guaranteed Bill Plan, you are charged a flat monthly bill so there is no price per therm. The amount GNG asked you to pay on your prior months bill. This is the amount you paid. This is any unpaid balance that remains from your last GNG bill. If you paid GNG exactly what you were asked to pay on your last bill, this amount will be $0. This is the amount that you will be charged under the Guaranteed Bill plan. This amount includes your AGLC Base Charge and all customer service and gas charges. Sales tax and other one-time fees and charges will be listed separately. For more information on prorated bills, go here. The actual charges for your service for the current billing period. GNG added up all of the Current Gas Service Charges above to calculate this amount. Your first bill - Because this is your first bill from GNG, this is the amount of your initially requested pre-payment. Subsequent bills - This is the estimated gas service charges from the previous bill. This amount appeared on your previous bill as line item Next Month’s Pre-Pay Estimate. 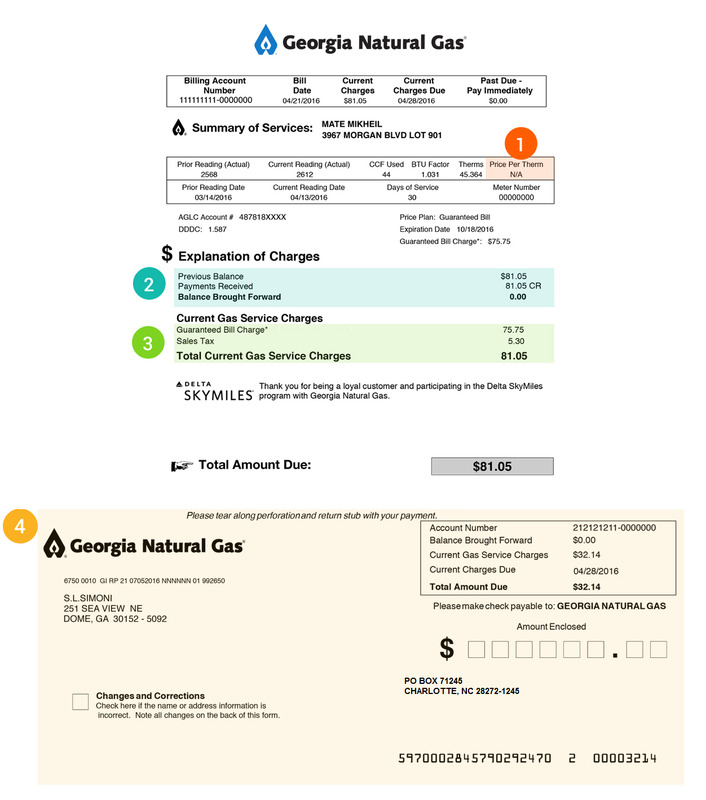 This is the difference between the estimated natural gas service charged upon initiating service and the actual natural gas service charges. If you were charged for more than you used, that amount is credited on this bill. If you used more than you were charged for, that amount is owed on this bill. Your estimated natural gas service charges for the next 30 days. This is the sum of the following line items on your bill - "Balance Brought Forward" plus "Actual Charges less Pre-Pay Credit (Previously Charged)" plus "Next Months PrePay Estimate." This amount must be paid in order to avoid interruption of your gas service.